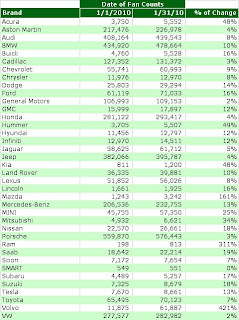 There is one clear leader in this month’s Automotive Facebook Fans by Brand report: Volvo. They ran some advertising campaigns developed for the Facebook platform. The first is one that’s been up a few months but was continuing to get some media dollars, Drive Around the World. The other is a lifestyle brand experience called Ice Camp that also has its own Facebook page. The Drive Around the World has Facebook friends travel together as each friend takes over the drive like passing a baton in a race. Volvo will then donate 15,000 Euros to a charity that fights Global Warming. Obviously the game has broad appeal with the charity aspect and social enablement. Altogether Volvo saw a 421% increase in January fan numbers. Quite impressive though like many of the huge percentage changes we have seen they only started with 11,875 fans at the beginning of the month. Most brands saw typical gains in January. GM brands saw a slowing down since backing off media spend on the platform, particularly Chevrolet and Cadillac (both had 50% gains in recent months), but this is typical and shows the difference between organic and media driven growth. Mazda saw a nice improvement this month. They also moved their Mazda North America page into the Mazda Facebook fan page which got rid of some confusion around how one follows the brand. The now retired Mazda North America fan page was more for Public Relations communications which seemed duplicative to the http://www.facebook.com/Mazda fan page. Both MINI and Acura ran advertisements in Facebook that I caught during the month. The Acura one was for increasing fans of their ZDX vehicle page, not the primary brand fan page. Meanwhile MINI promoted their coming Countryman SUV. 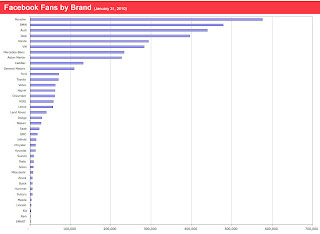 This shows that both brands are interested in further developing vehicle fan pages which to me seems odd since both are niche vehicles and it would be better to get consumers engaged more with the brand than an isolated product. Toyota is an interesting brand this month, not so much for its growth but it’s public relations fiasco with its faulty pedals on 8 vehicles. Currently, the Toyota fan page has a status update pointing fans to http://www.toyota.com/recall for information about the company’s response and updates. This shows that brand pages can act as another communication medium to keep consumers up to date on major announcements. 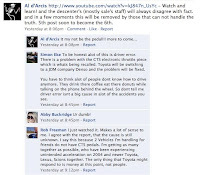 Brands be warned; one “fan” keeps posting a news video that discusses Toyota allegedly concealing and destroying information. That “fan” has posted the story five times with four posts having been deleted by the page administrators. He continues to post the story on the Toyota fan page wall. So, it works both ways and the brand should just let the post live since it is just a link to a news story and removing these posts might cause more of a PR issue. Where did you get the numbers? 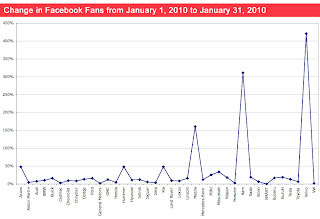 Facebook insider or just tracking each of the brands and jotting down their followers every month? I find the Facebook Insider report to be missing a lot of manufacturers and found it pointless compared to tracking it myself every month. Thanks for reading and if you need any data let me know.